The ultimate team building challenge. Leap of Faith offers everything you need for an enjoyable and successful team building session. 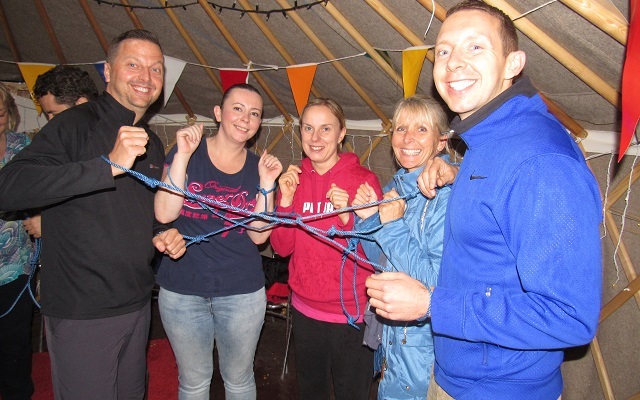 We combine gentle climbing activities and exhilarating challenges to deliver a fun and memorable experience for the whole team whilst ensuring your business objectives have been met. Our namesake Leap of Faith challenge is the ultimate test of nerves! Get clipped in, climb the 25ft pole, take a deep breath and make 'The Leap' for the bag – which can be up to 12 ft away! This is Bristol’s only giant swing, so don’t miss your chance to experience this high-speed, adrenaline-filled rush! Eleven exciting challenges, including the High Wire Ladder, the Gladiator Wall, Totem Pole and Wolf Wall. An exciting hybrid of an Escape Room and a Wilderness Survival challenge that uses maps and radios to locate items crucial for survival. The challenges are so varied that you will find yourself axe throwing one minute and taking a selfie with a giraffe the next! You will also have to build a shelter, light a fire and get the brew on so you can toast those marshmallows... assuming your team found them!. This is a real favourite for team days, best for those with a moderate level of fitness and can be structured for team building, bonding or leadership. The name of the game is to make the biggest stack before it collapses. Did we mention you’re standing on top of it? An excellent test of balance, agility and teamwork, guaranteed to bring your team closer together! In teams of four, you’ll need to work together to climb to the top of a 9-metre pole and stand on a platform the size of a dinner plate! Requires cooperation and communication to stay together. Once you’ve found your balance, will your team be brave enough to lean back? Give your team the opportunity to experience the thrill of axe throwing in the woods. It’s highly addictive as you compete against your colleagues for the highest score. Everyone always wants ‘just one more go’! Dive head first into one of our bubbles and enjoy an action-packed session attempting to barge your colleagues off the ball. With loads of games such as fox & hounds, the last man standing and good old footy in a giant bubble it's unsurprisingly a really popular activity.